I rarely make muffins at home and never order one when I’m out and about as I find they’re often far too sweet and never truly that satisfying. I realize, too, in looking back at my cookbook that there’s only one muffin recipe throughout. Case in point: I’m tentative on muffins. But not these. We’ve been pretty thrilled to have this healthier version of Morning Glory muffins on the counter this week; they have little bits of apple, raisins, walnuts, and grated carrot and are cloaked in a buttery oat crumble topping — quite the opposite of your boring coffeeshop fare. 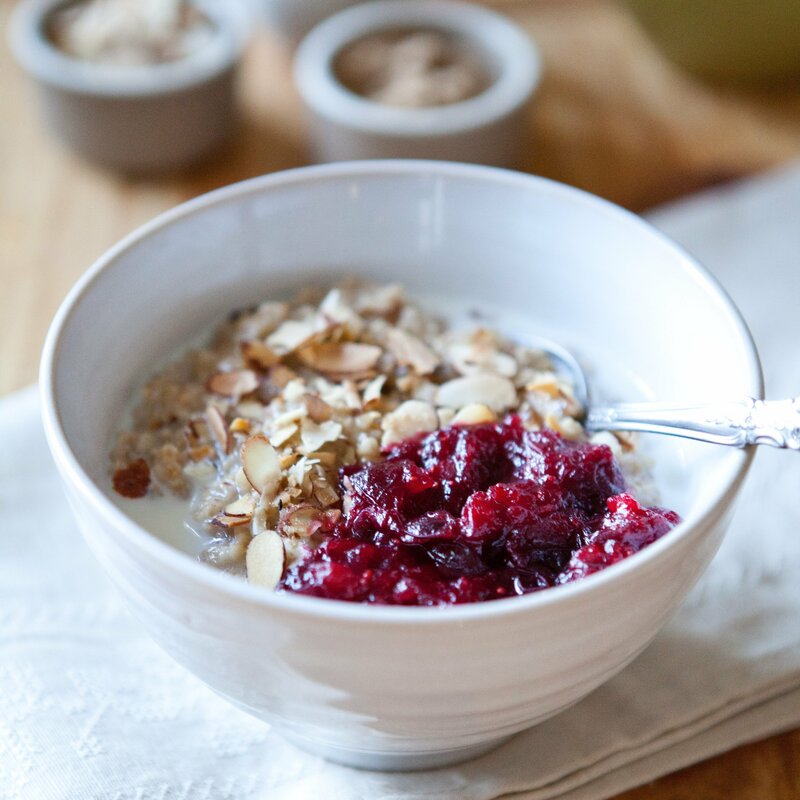 I thought long and hard about doing a Valentine’s post, some festive cookie or confection that would be share-worthy this weekend, but the more we talked about what our weekend would really look like, it involved something special for breakfast instead. I don’t remember the last time a Valentine’s Day fell on a Saturday, so we have big plans to have breakfast in bed and if your plans are even remotely similar, these muffins would be a fine inclusion. I remember when Sam and I were first dating long distance, and occasions or holidays would feel like a hurdle: I’d so wish we could be together and fell into the trap of constantly thinking towards the next birthday or the next Valentine’s Day and assuring myself it’d be different the following year — envisioning the grand places where we might celebrate (if we were in San Francisco maybe at Zuni to share the famous chicken and a few oysters; if in Seattle, perhaps Spinasse for a plate of that simple, buttery pasta). The funny thing: now that that period in our lives is over, I think much less eagerly towards grand dates or sweeping gestures, and look forward to the smaller dates and moments. Sam asked last night if we should think about going out to dinner on Saturday and we both glanced at each other with the same look in our eye: I hope the other says no; let’s stay in. This is not to say that we don’t love going out because we love trying new cafes around town and visiting our favorite neighborhood spot, but there’s something almost more special about planning the quieter moments — figuring out what kind of pancakes we’ll make and how to balance the coffee on the bed without spilling it, making homemade whipped cream, catching up on the week. I have a quote taped to the computer in my office at Marge; it’s an Annie Dillard quote that reads “How we spend our days is, of course, how we spend our lives.” It’s possible I’ve shared this quote here before, but I can’t remember and maybe it’s a good one to revisit regardless. Instead of inspirational photos of people and places, this alone serves as a good reminder when I start to feel overwhelmed by all of the Bigger Things in life (success of a business, taxes, celebrating holidays and occasions). While fancy dates and dinners are nice, it’s really the everyday meals (and occasional breakfast in bed) that comprise most of our life — and when focusing too much on the grand and fancy, you lose sight of most of the really good stuff. Like muffins in bed. I hope you have some this weekend, solo or joined by someone you love. 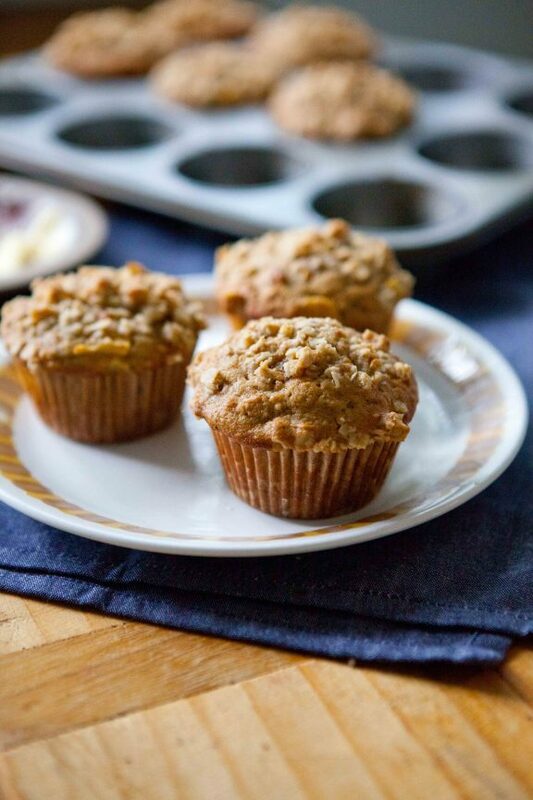 Megan’s Note: I know the ingredient list for these muffins looks long, but a handful are spices alone and I imagine a few are things you already have in your pantry. I know some of you are hesitant about coconut oil, but it really is so wonderful in these muffins; it has a sweet fragrance that adds so much. If you don’t have it or would rather not use it, I imagine that butter would work just fine as well. I haven’t tested these with butter, but I can’t think of any clear reason why they’d be negatively affected (if you try it, let me know!) The one thing to remember about the oil: do make sure it isn’t very hot when adding it to the wet ingredients as you don’t want to curdle your yogurt and milk — I let mine cool to almost room temperature while still making sure it’s in its liquid state. 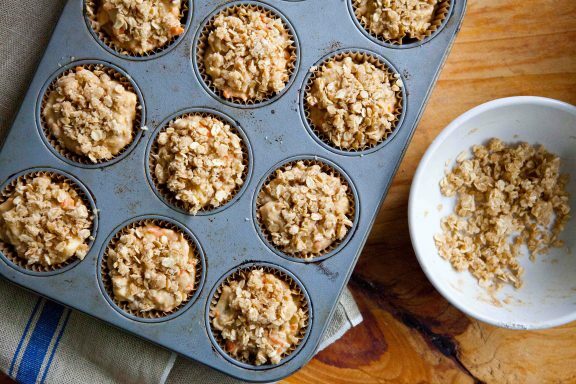 My best advice for these muffins is not to be conservative with the crumble topping; as the muffin tops spread in the oven you’re going to wish you had more of it, so feel free to really layer and even lightly press it onto each. In a large mixing bowl, whisk together the two flours, oats, sugar, baking powder and baking soda, spices and salt. 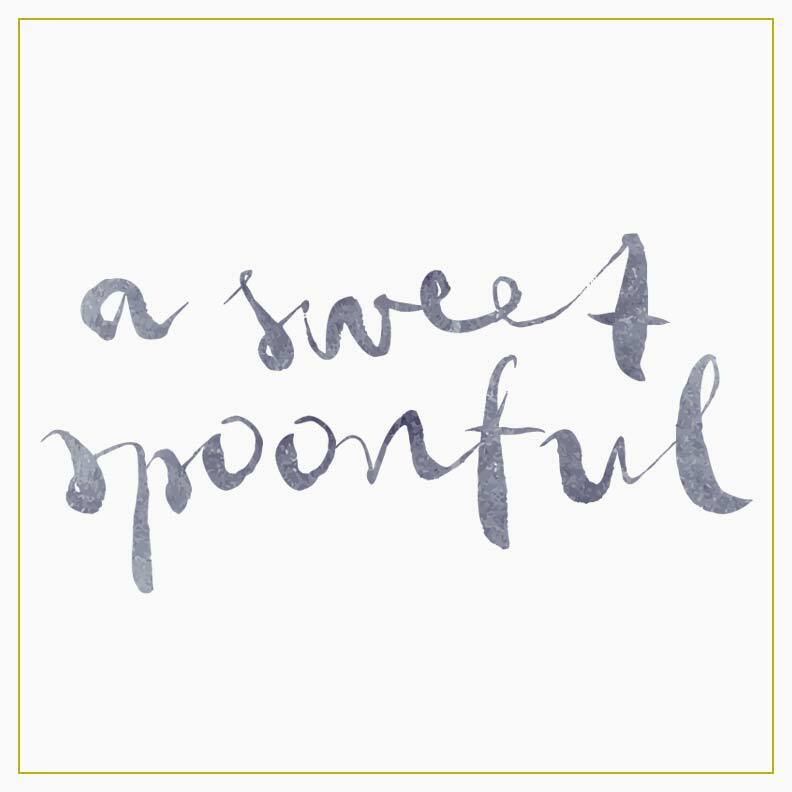 In a small bowl, whisk together the eggs, applesauce, yogurt, milk, coconut oil and vanilla extract. 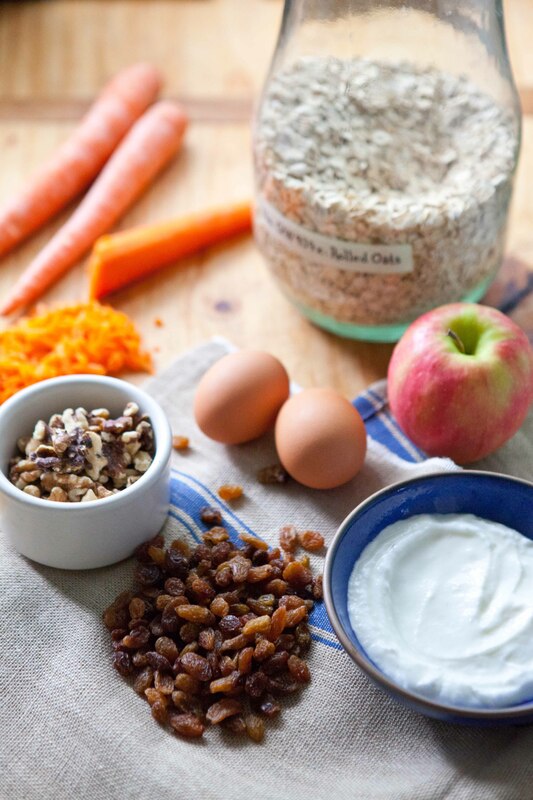 Fold in orange zest, apple, carrots, raisins and walnuts. Scoop batter into 12 paper-lined muffin tins, filling each almost to the top. Spoon crumble filling on top. Bake for 25-27 minutes, or until muffins are golden brown around the edges and feel firm to the touch, even in the center. Let cool in the tin for 10 minutes. Muffins will keep for 2 days if stored covered at room temperature. These look scrumptious!If I replace the whole wheat and all purpose flour with a gluten free all purpose flour do you think they'd turn out the same? Or use all oat flour maybe? Would love to try them but can't have gluten. Your morning glory muffins look like such a delight. Definitely need to try these! These look fantastic! 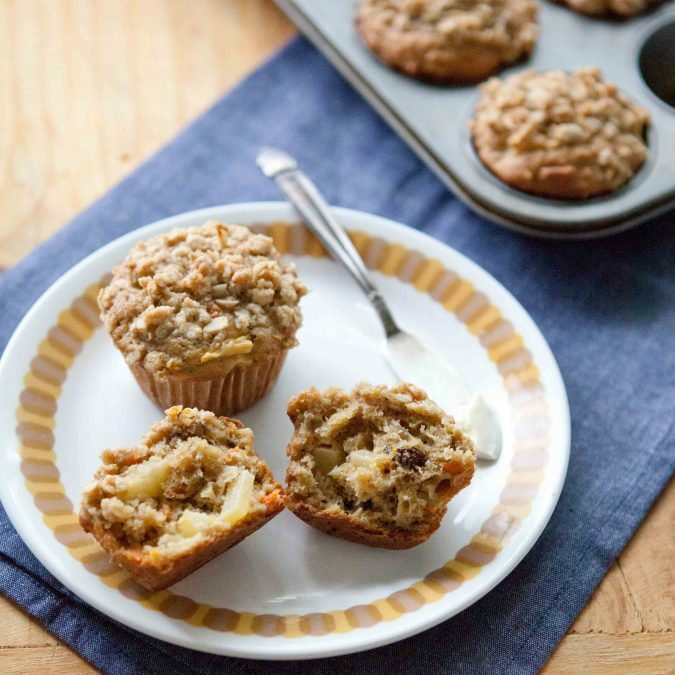 Our house is filled with smiles and cheers when I bake your pear and hazelnut muffins...look forward to baking these beauties this weekend :) Thanks for sharing! I'm running home to bake these, pronto. I'm not normally big on muffins either - and I'd definitely eat them as a snack rather than breakfast - but these look so good. I love the little apple-y chunks and the ingredient list is so wholesome. 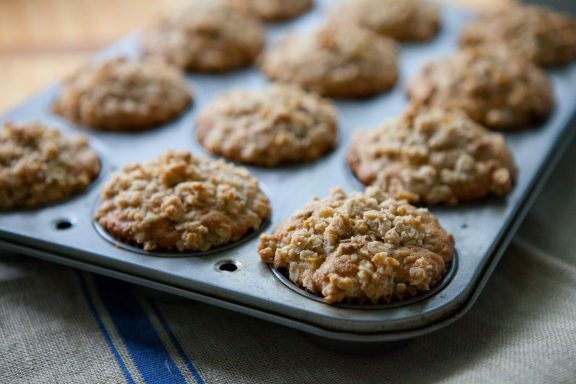 I love your breakfast muffins, along with every other recipe in your cookbook. I have fun experimenting with the mix-ins. Can't wait to make these! Recipes like this really help me add variety to breakfast and snack time. Morning glory muffins are my go-to, and my recipe is remarkably similar BUT! I've never tried a crumble topping! Kills a bit of the health factor but my guess is that it's well worth it. I'll try it out and see! love the crumble topping! such a good idea. I think these might be added to the weekend "To Make" list. They will be my sustenance in between shoveling another mountain of snow here in Boston... oy. Crumble toppings: I can't get enough! Thanks for the recipe, Megan! Happy weekend to you and Sam! Made them on Sunday and they were SPECTACULAR! I used Bob's Red Mill gluten free cup for cup flour and the texture was perfect. Just the right amount of sweetness, crunch, and I love how moist they turned out. I'll be doubling the next batch for sure! Hello! I've been reading your blog for almost a year now but haven't yet commented before. I'm not sure why, but today, I finally decided that I need to as I love your posts. I truly get excited when they come out - how you write and the recipes you post are always unique and very special. Thanks for another great one today - these look delicious! My husband and I love our weekend morning rituals, and when we are having a particularly grueling work week, we often celebrate the weekend morning by staying in bed for a couple of hours, drinking coffee or tea and watching the cooking channel. Bliss. These look like lovely muffins with the perfect amount of spice. They would go so well with our weekend coffee or tea. These will be perfect for our family weekend brunch! Yum! What a wonderful post. I often forget how wonderful life's everyday moments are until I see pictures of my kids goofing off and think...tomorrow, I'm really going to pay attention. The muffins look like Saturday morning to me! This is my second time making these muffins. First, they were a hit at a baby shower and tomorrow I'm bringing them for a birthday brunch at work. They are definitely labor intensive on the front end, but SO DELICIOUS! Yes, the ingredient list is long, but most of it is pantry staples (for me, at least)! I used a tablespoon of orange marmalade because I didn't have any oranges for the zest and I pureed an apple with a little apple juice because I didn't have applesauce. The muffins turned out beautifully and my family made them disappear in record time. 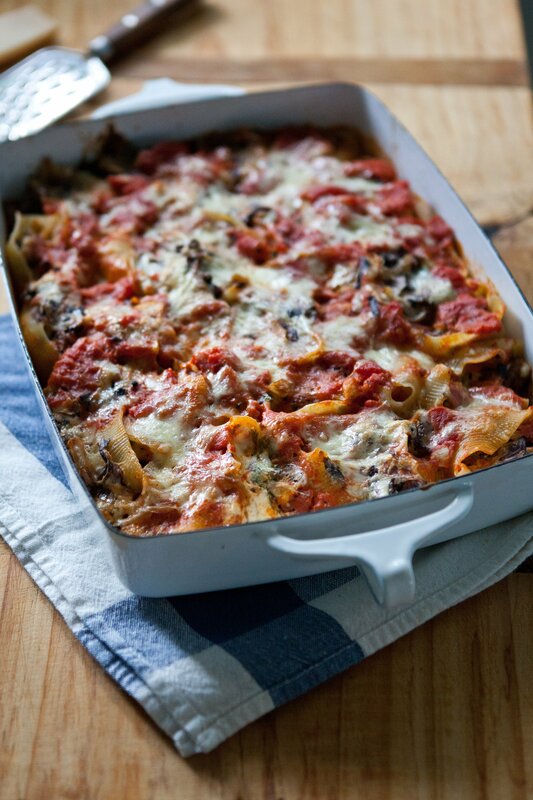 This recipe is absolutely a keeper!